Calling all Twin Cities residents! During our Minnesota winters, you may find yourself bunkered in by your fireplace, staying inside all winter long. Or perhaps you are one of the cold lovers that enjoy the time spent outside in colder climates! Although it can be tempting to hibernate when the snow and cold hit, here are a few great ideas for this winter to get yourself and your family out of the house. Open January 26 – February 5th, the Saint Paul Winter Carnival is one of our favorites! The carnival includes multiple parades, Rice Park Ice Sculptures, the incredibly popular medallion hunt and more! Sign up for the Securian Winter 5K/10K and half marathon that brings runners through downtown St. Paul along the Mississippi River. Attend the Winter Beer Dabbler with craft beer from over 120 breweries, live music, and gourmet food from local food trucks! Or bring the family to the Wells Fargo WinterSkate for a free skating rink in the heart of downtown St. Paul (open through Feb 5 – skate rental available). Red Bull Crashed Ice Championship – Make a trip to the front steps of the Saint Paul Cathedral on Feb 3-4 to watch some of the top skaters in the world compete in a high-speed downhill competition. First skater to the bottom wins! 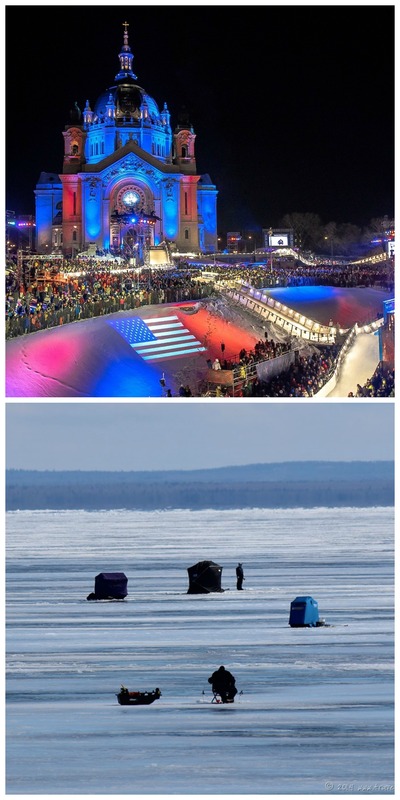 Over 120,000 people show up to watch and do some pre and post championship socializing in the Crashed Ice Village with food, drinks, athletes, live music and more! Labatt Blue U.S. Pond Hockey Championships – There is no shortage of hockey fans here in Minnesota. Stop by Lake Nokomis January 26-29 as thousands of players and fans get together for an incredible weekend of fun and fierce competition. Whether playing in the tournament or just coming to cheer them on, it is a weekend dedicated to playing hockey the way nature intended. Why stop fun on the lake when the water freezes over?! Here in the land of 10,000 lakes, we take our fishing seriously, and that means fishing all year round! 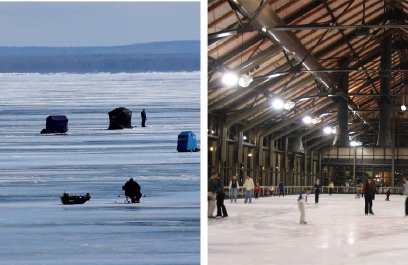 Set up recreationally or join in one of the many ice fishing tournament around the Twin Cities metro area. This former Minneapolis train shed was turned into a beautiful indoor ice skating rink with floor-to-ceiling glass walls giving you a breathtaking view of the cityscape. It’s fun, romantic, and even better – it’s warm in the winter! Time to dust off your skates and take advantage of a night out with skating, hot cocoa and plenty of food (skate rental available). Start the new year testing your luck at the blackjack tables or slot machines at Mystic Lake Casino & Hotel in Prior Lake. Spend the evening/weekend at the hotel while enjoying the many amenities offered from all-you-can-eat buffets, top-notch entertainment and shows, gambling and relaxation. Attend a show at the Guthrie or Orpheum Theaters. This winter the Guthrie Theater features productions of The Royal Family and Promise Land, while the Orpheum features Mamma Mia!, Matilda and Wicked productions along with comedian acts like Jerry Seinfeld and Chris Rock. Catch a game at the Xcel Energy Center or Target Center to cheer on your favorite Minnesota sports team! From the Wild to the Timberwolves, a night out at these events is a great way to get out and maybe event get some autographs for your children! Spend an evening at Como Zoo’s free concert series, “Music Under Glass”, select Sundays in the Conservatory. Beer, wine, pop and snacks available for purchase. Or treat your Valentine’s date to an extra special treat Feb 11, 12 or 14th. What is better than giving flowers to your date? Dining amongst them with a candle-lit dinner in the warm, comfy confines of the Conservatory’s indoor gardens. Reserve your spot NOW! For more ideas for more indoor or outdoor activities this winter, click the links below. If you venture out and about, be sure to come out and visit our model home in Lakeville – open Thursdays-Sundays from 12-5pm! You’ll stay warm and be stunned by the custom home design and lake views.